Bracelets, earrings and necklaces: Jewellery made of PVC is inspired by the ocean and is extremely creative. Little wonder that the Creative Design SolVin Award 2010 went to Molusk of Paris. 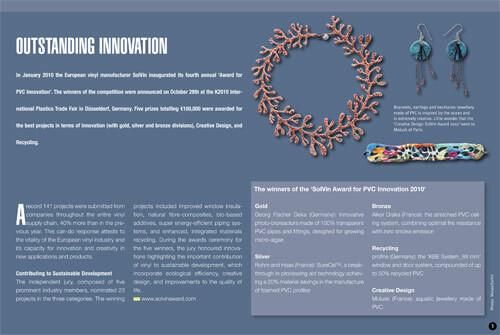 In January 2010 the European vinyl manufacturer SolVin inaugurated its fourth annual ‘Award for PVC Innovation’. The winners of the competition were announced on October 28th at the K2010 International Plastics Trade Fair in Düsseldorf, Germany. Five prizes totalling €100,000 were awarded for the best projects in terms of Innovation (with gold, silver and bronze divisions), Creative Design, and Recycling. A record 141 projects were submitted from companies throughout the entire vinyl supply chain, 40% more than in the previous year. This can-do response attests to the vitality of the European vinyl industry and its capacity for innovation and creativity in new applications and products. Contributing to Sustainable Development The independent jury, composed of five prominent industry members, nominated 23 projects in the three categories. The winning projects included improved window insulation, natural fibre-composites, bio-based additives, super energy-efficient piping systems, and enhanced, integrated materials recycling. During the awards ceremony for the five winners, the jury honoured innovations highlighting the important contribution of vinyl to sustainable development, which incorporate ecological efficiency, creative design, and improvements to the quality of life.